Activists working with the New Sanctuary Movement, which shields undocumented immigrants in the U.S. Photo courtesy of Linda Rabben. I used to take audiences on a 125,000-year tour of these two venerable institutions. I’d tell them about bonobos, chimps, and baboons giving sanctuary to members of enemy primate communities; about the ancient custom of seeking sanctuary by touching the garment or body of a powerful priest or ruler; about 1,000 years of church sanctuary in England and other countries; about the Underground Railroad, Holocaust rescuers, and the Sanctuary Movement of the 1980s. But recently, at a high school in suburban Maryland, the students’ first question was, “What can we do to help refugees and asylum seekers right now?” They also wanted to know how I, as an activist, keep going in the face of politicians’ racist and xenophobic attacks on people fleeing persecution, torture and murder. “First of all,” I said, “I’m a very stubborn person, prone to indignation about injustice.” I explained that I try to undertake modest efforts to help migrants in my local community, so I can see short-term, positive results. And I said that those who defend and protect refugees and asylum seekers are part of something much bigger than themselves, something that’s been going on for thousands of years. Giving refuge to the stranger is in our DNA. We’re a highly social species, as likely to welcome outsiders as to drive them away. Hospitality, protection, welcome, and refuge are ingrained in our customs and behavior. In many societies studied by anthropologists and historians, hospitality may be extended to members of hostile communities. Offering refuge to strangers diversifies the gene pool, encourages innovation, and enriches cultural practices. It institutionalizes empathy, mercy, sociability, and openness. Shelter for those accused of wrongdoing or fleeing from persecution or slavery has existed in every major religious tradition and in numerous societies since time immemorial. Its recorded history goes back at least 5,000 years. Sanctuaries have included altars, churches, temples, cities, and sacred groves. Asylum comes from the Greek word asylos, “inviolable,” which referred to sacred spaces in ancient Greece to which slaves could flee from cruel masters. Even the ancient Romans, who were not renowned for their compassion, built temples where slaves and miscreants could flee. When Christianity became the official religion of the Roman Empire, the Catholic Church borrowed sanctuary from other traditions. Church sanctuary lasted for more than a thousand years in Europe, until governments abolished it in the 17th century, because it interfered with their control of the legal system. The Treaty of Westphalia, which ended the Thirty Years’ War in 1648 and laid the foundations of modern international law, proclaimed provision of asylum as a sovereign right of nation states. Thus asylum, a secular institution under state control, replaced religious sanctuary in the law. Over the past 500 years, government asylum and religious sanctuary have sometimes run along parallel lines, sometimes conflicted and sometimes diverged. During the 20th century, governments started passing laws to restrict access to asylum, especially before, during, and after wars, when massive numbers of desperate, persecuted people sought refuge. Those who defend and protect refugees and asylum seekers are part of something much bigger than themselves, something that’s been going on for thousands of years. In response to the flight of refugees from Germany and other European countries in the 1930s, the principle of nonrefoulement came into international law. It stipulates that no asylum seeker may be returned to a country where he or she will be persecuted, tortured, or killed. The Universal Declaration of Human Rights, adopted by the United Nations in 1948, proclaims, “Everyone has the right to seek and to enjoy in other countries asylum from persecution.” But despite signing many international agreements and passing national laws that mandate these principles, governments have often violated them for political and economic reasons. So sanctuary usually operates outside or against the law. The Underground Railroad was an illegal, secret movement, some of whose leaders were prosecuted, fined, or imprisoned. Holocaust rescuers risked death, and some were killed, for hiding thousands of Jews. The U.S. government prosecuted leaders of the 1980s Sanctuary Movement for harboring or smuggling migrants. 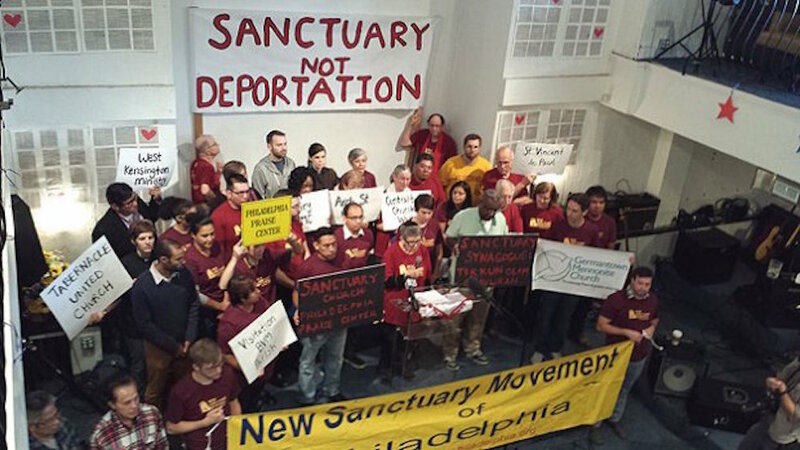 Yet sanctuary thrives as a powerful expression of resistance to unjust laws. It is often a deliberate act of civil disobedience. Giving sanctuary may mean accepting the risk of prosecution to obey what its practitioners consider a higher law. Sanctuary has life-saving meaning to those who seek it and is a moral imperative for those who provide it. That is where its power lies. At the peak of the 1980s Sanctuary Movement, some 400 churches and dozens of cities gave shelter to thousands of Central Americans denied asylum in the United States. The churches’ and cities’ efforts, along with widespread opposition to U.S. backing of murderous regimes in Central America, helped change U.S. foreign and immigration policies. After 1988, the U.S. government lessened support for repressive governments in that region and allowed more Central Americans to stay in the United States. The New Sanctuary Movement started about 10 years ago, to aid Mexican and other migrants living in the shadows. Over the past two years, dozens of churches around the country have given sanctuary to undocumented people, for months at a time. The migrants waited in the safety of churches and synagogues while their lawyers negotiated with the government for suspension of deportation orders. Then the migrants returned to their U.S. families to await the outcome of their cases. These are a few among many examples of successful sanctuary, in highly publicized instances where local communities know and support migrants and their families. For decades U.S. enforcement agents have refrained from raiding schools, hospitals, and houses of worship. The government seems to have recognized that invading traditional safe havens would arouse public outcry. However, U.S. Immigration and Customs Enforcement, or ICE, could cancel this “sensitive-locations policy” at any moment, leaving sanctuary-giving institutions vulnerable to government intrusion. Even during the Obama administration, agents raided private homes without warrants, sometimes under false pretenses. They arrested undocumented high school students on their way to school, parishioners in church parking lots, and patients outside hospitals. More than 2 million undocumented people were deported from the U.S. between 2009 and 2016. ICE increased the number of detained migrants in 2016 from 34,000 to more than 40,000 per day, in hundreds of facilities. Like the Reagan administration during the 1980s, the Obama administration refused to recognize most Central American asylum claims. The government detained thousands of migrant mothers and children, even after federal courts ordered their release. The Trump administration already has shown that it will show no more mercy toward undocumented people or would-be asylum seekers slated for detention and deportation. In response, increasing numbers of people are likely to offer sanctuary in houses of worship, educational institutions, and their own homes. As millions of desperate people flee persecution, war, and environmental disaster, and governments refuse to shelter them, asylum is under threat all over the world. But history teaches that sanctuary is an integral part of human nature. It will last as long as people of good will are ready to risk welcoming the stranger. Linda Rabben is an associate research professor of anthropology at University of Maryland and the author of Sanctuary and Asylum: A Social and Political History (University of Washington Press, 2016) and other books on human rights.